Module 1 (of 6) introduces the exciting world of natural gas, followed by discussion of the chemical and physical properties of natural gas components (methane, Natural Gas Liquids). 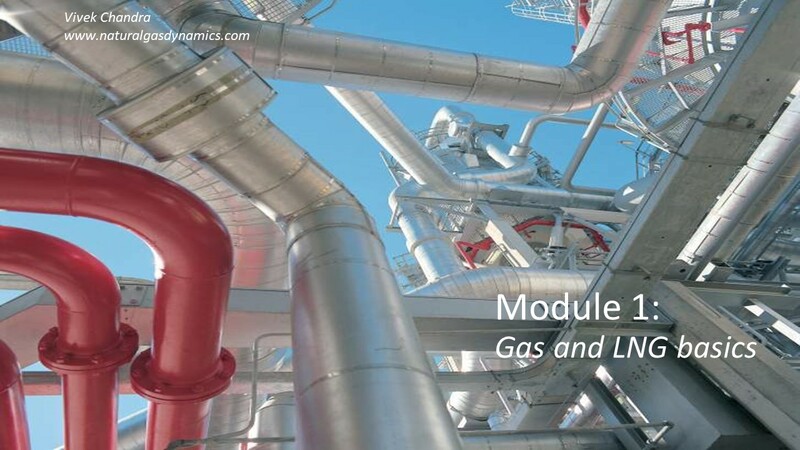 Module 1 also decodes the mystery of gas units, and ends with an introduction to the gas chain, briefly evaluating pipeline versus LNG transport options. ~40 minute video lesson. Module 2 (of 6) begins with a brief discussion of how natural gas is found and characteristics of reservoir rocks. The focus of the module is the difference between Conventional and Unconventional gas resources. The focus of the unconventional gas discussion is shale gas and coal bed methane. The module ends with a discussion on whether (or not) the United States shale gas experience can be repeated in other countries. ~40 minute video lesson. Module 3 (of 6) is focused on the LNG chain. The section begins with a discussion on the liquefaction temperatures of natural gas components, The capital expense of each aspect of the LNG chain are then presented followed by sections on each component of the chain (liquefaction, shipping, regasification). Advantages and disadvantages of emerging technologies such as floating liquefaction and floating regasification are also introduced. The module ends with a discussion on LNG project risks and success factors. ~50 minute video lesson. Module 4 (of 6) begins with an overview of global gas pricing models, and how in some regions, such as Europe, the model has changed dramatically in a short period of time. The section also discusses the famous LNG 'S' curve pricing formula as well as its main negotiated items (slope and constant). The pricing section ends with a comparison of the 'S' curve with the US 'hub price + costs' model. The rest of the module covers gas and LNG sales agreements, introducing concepts such as Term, Take-or-Pay, and Price Review. The module concludes with a discussion of LNG project economic models, comparing the traditional integrated model with the US tolling model. 55 minute video lesson. This module will discuss global LNG demand and supply, with focus on the increasingly important Asian market and US supply. There will be discussion about Indonesian declining domestic production (as a proxy for many other gas producing nations and regions such as Europe), drivers for growth in Chinese market. The lack of export project sanctions over the past few years, plus a detailed evaluation of delivered LNG prices comparing US and ‘traditional’ suppliers will complete this important module. ~30 minute video lesson. Module 6 (of 6) is the final module of the course. The module begins with a discussion on the environmental benefits of natural gas, the growing resemblance of natural gas markets to other commodities, and discussion of the key factors sought by LNG customers. The course will conclude with a high-level discussion of future LNG supply sources, growing LNG demand from emerging markets, and the role of floating regasification units in opening up new markets. 20 minute video lesson. Click on image below to watch Module 1 for free.